It’s been another week of being busy and not busy at the same time. Classes are pretty much the usual lecture and note taking, the occasional class cancellation. We actually had a test in Bengali last week – he gave us a sheet of 20 words or so, and we just had to go up in front of him and pronounce the words and know the meaning of a few of them. He gave us 3 tries to pronounce the word correctly and even coached us through it, so I’m glad we’re all on the same page of having low standards. I’m still struggling with finding the balance of staying in to get work done and going out to have fun – lately, I’ve been staying in a lot and trying to get through my very long to-do list so I can relax in Kerala and not be really stressed out my last week here. I had a busy weekend though! Thursday was Kia’s birthday, so we all went to her house after school where we had cake and her mom made some really delicious egg rolls as a snack. There was some delicious sweet chili sauce on them – I’m going to have to buy some of that sauce to bring home with me! We went out to eat at a Thai restaurant in South City Mall. The food was really delicious but Brynn and I did a poor job about ordering to share. Kathryn had been there before and told us we could order one dish and share…but i guess that’s only some dishes! The dishes we ordered were delicious, but definitely enough for just one person. We had little mini spring rolls and some dish that was mushrooms and baby corn in a sweet and tangy sauce. It was too bad it was too expensive and we didn’t have enough time to order something else, so I actually got a Subway sandwich afterward! Subway is pretty much the same as it is at home, except that may of the dishes are specific to India – some “aloo” dishes or chicken tikka masala, for example. Friday was our LAST Friday of class, and our last day of Sheta’s class. 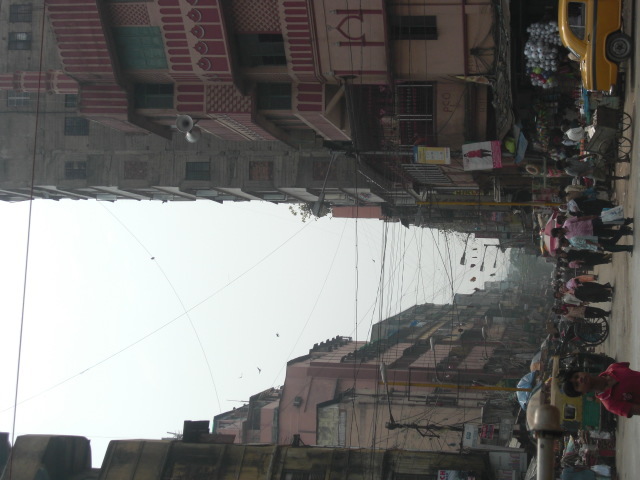 She had a speaker for the first two periods of her class who was talking about the history of Kolkata. As usual, it was a lecture and I have realized that I do NOT learn well or retain information that way and need some kind of visual aid to pay attention. It seems that Sheta can’t stand not speaking for more than an hour, because the second period she got up and was cutting off the speaker! They were just talking/yelling over each other – and the best part was when the speaker brought out this map of Kolkata and both were yelling over each other to tell us, “This color means parks! This color means schools!” It was too ridiculous. Later that night, we went out to dinner with our host family to a Chinese restaurant, which was great! It’s so nice to spend time with them, and I had some of the most delicious wantons and honey chicken I’ve ever had! 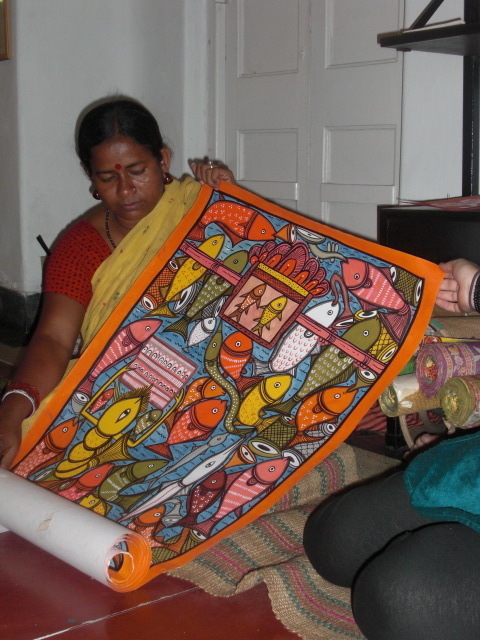 Saturday was devoted to art workshops – the first was about patachitra, or traditional Bengali folk paintings. They’re painted on a huge long scroll and used to tell stories through song – and the paints are made from vegetables and leaves! The artist told us a few stories first with her very elaborate scrolls – one story about the goddess Durga, another about a fish marriage, and another about the 2004 tsunami. After, we all got to try some painting ourselves! I bought some of her art too (I have such a weakness for the rural handicrafts). I bought myself a painting of the fish marriage and another painting to give away as a gift. We had a dance workshop immediately afterward, which was the first dance class of my life! We learned a dance that told the story of a young bride being welcomed into her new husband’s/family’s home. We had a great teacher who has a lot of fun when he’s teaching, and I think I didn’t dance too horribly. I guess we are going to perform this dance next week for all of our host parents as a way to celebrate Bengali New Year! We’ll see how it goes. 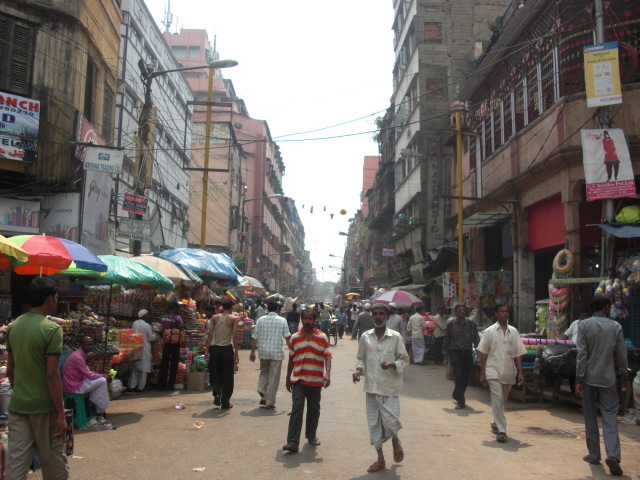 Sunday was busy too – we spent all morning touring Kolkata. We saw mostly religious worship sites – a ton of churches and a couple synagogues! It was my first time ever in a synagogue. We didn’t see any mosques, because women are not allowed in mosques…lame! We also stopped at a Bengali folk arts museum, which had some really incredible embroidered linens. Women embroidered these bed covers and other household items with such detail and skill – and all the thread came from the borders of old saris. 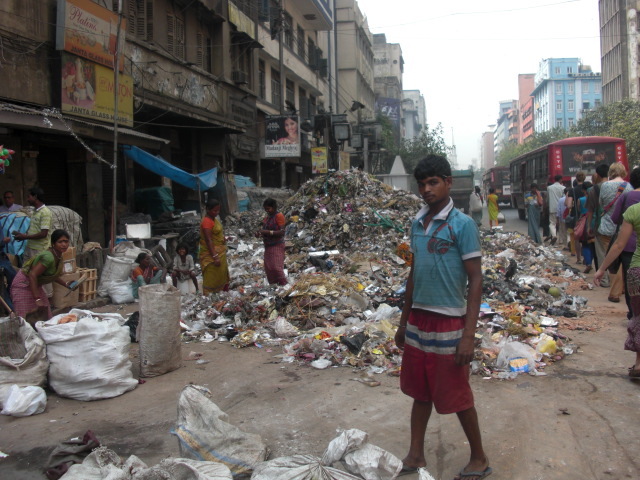 There were also a few examples of patachitra, some clay or metal dolls, and more. We went out to eat for lunch at a Chinese restaurant for a buffet – the first buffet I’ve had here. It was pretty delicious!